SCN2A. Frequency of pathogenic SCN2A variants in various epilepsy cohorts. The frequency of pathogenic variants in SCN2A and the 95% CI is shown. The dotted line represents the weighted mean of all included studies, which represents 19 pathogenic SCN2A variants in 1634 patients. 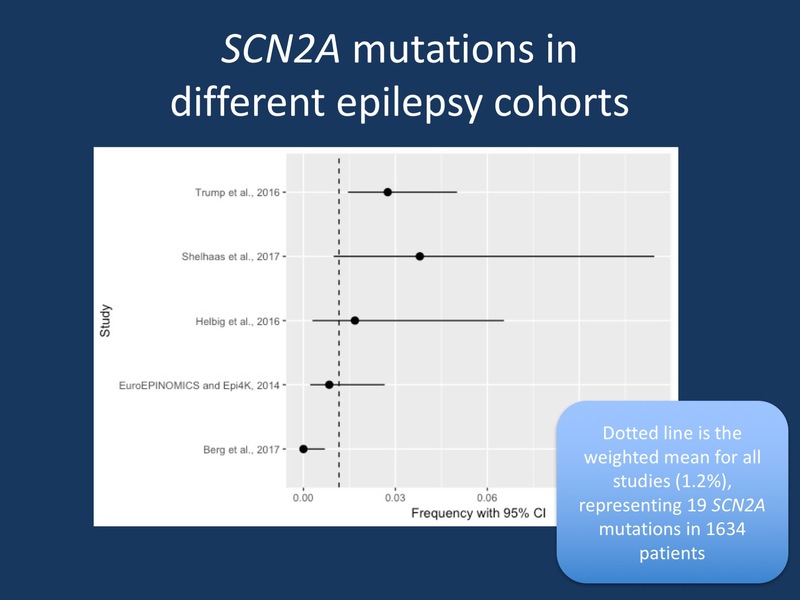 Overall, in epilepsy cohorts, there is good evidence to believe that pathogenic SCN2A variants occur at a frequency of roughly 1%, but it is difficult to assess the effect of biasing in studies. Accumulating epidemiological evidence. Two studies by Berg and colleagues and Shellhaas and colleagues present epidemiological data on prospectively-recruited large cohorts of children with early-onset seizures and find utility of genetic testing. In 680 prospectively recruited children with seizure onset before 3 years of age, Berg and colleagues report an overall diagnostic yield of over 40% in those who underwent any type of genetic testing, including microarray, NGS panels, and whole exome sequencing. Explanatory pathogenic variants were found in all etiological groups, including children with brain malformations, metabolic diseases, dysmorphic syndromes, and no explained etiology for their seizures. Pathogenic variants were found in 27% of children with no identifiable etiology, with a significantly higher diagnostic yield in children with seizure onset before 12 months. The diagnostic yield for chromosomal microarray testing was substantially lower (8%) compared to NGS-based testing (30%) in children with no identifiable seizure etiology. Notably, a metabolic workup only yielded a diagnosis in 4% of children, the majority of which can be diagnosed through genetic testing. Shellhaas and colleagues focus on neonatal-onset seizures, prospectively enrolling 611 neonates over a nearly 3-year period. 79 of these newborns were found to have a neonatal-onset epilepsy, classified as a neonatal epileptic encephalopathy in 44%, secondary to a congenital brain malformation in 41%, benign familial neonatal epilepsy in 14%, or benign neonatal epilepsy in 1%. A causative genetic etiology was found in over 75% of those newborns who underwent genetic testing, including 83% of patients with neonatal epileptic encephalopathies. Unsurprisingly, the most common causes of neonatal epileptic encephalopathies were KCNQ2 and SCN2A. Two-thirds of the BFNE patients had a confirmed genetic diagnosis (KCNQ2 or KCNQ3), and even 26% of patients with congenital brain malformations had an explanatory genetic finding. Microarray was only diagnostic in 17% of patients with epileptic encephalopathy and 5% of patients with brain malformations. Where are the missing SCN2A and KCNQ2s? Surprisingly, Berg and colleagues only identified two patients with pathogenic variants in KCNQ2 and no patients with SCN2A in their cohort of 680 patients. This difference is statistically significant when compared to the high frequency of both genetic diagnoses in the Shellhaas paper. This tells us that the cohorts of both studies are different, but are we overestimating the frequency of these two genetic disorders in general? Or is there another explanation for the “missing” KCNQ2 and SCN2A patients in the Berg cohort? First of all, we do not know how many patients in the Berg study were tested for SCN2A and KCNQ2, so it is possible that these patients have gone undetected. Secondly, the Berg study had a wider scope than just the neonatal period, which is when we expect the majority of these disorders to present. Taking into account these two factors may explain for some of the “missing” patients with genetic etiologies that present with neonatal seizures. Towards a new consensus? Do these new studies help move us towards a new standard when it comes to genetic testing in patients with early-onset epilepsy? The diagnostic yield of chromosomal microarray in both studies was substantially lower compared to NGS-based methods, which supports the use of NGS-based tests as a first-tier diagnostic test in over chromosomal microarray in patients with early-onset seizures. A metabolic workup is common in children who present with seizures early in life, but it is notable that only 4% of children received a metabolic diagnosis, and those who did receive a diagnosis through a metabolic workup would have been diagnosed through genetic testing. The efficiency of epilepsy panels vs. whole exome sequencing, based on data from these cohorts, remains equivocal. Although chromosomal microarray is currently considered a first-tier diagnostic test for children with developmental delay, these studies provide additional evidence that for early-onset seizures, NGS-based testing may be more efficient. This entry was posted in 2017, KCNQ2, SCN2A and tagged KCNQ2, neonatal seizures, SCN2A. Bookmark the permalink.